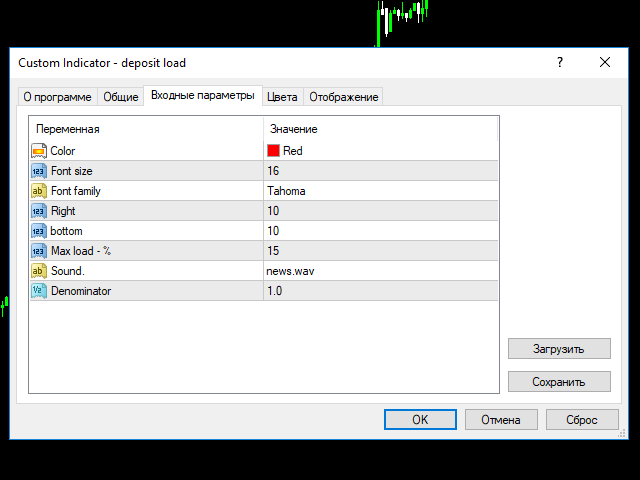 A very useful indicator for trading, which shows the current load on the deposit. The load is calculated by the formula (margin / balance) * 100%. If necessary, the indicator beeps when the load on the deposit exceeds a certain level. The load is displayed total, taking into account all open positions. Font family is a font family. Right - indent to the right. Max load - the maximum load at which the sound signal will be given. Denominator is the denominator. This number will be divided by the total load. The default is 1. That way, you can buy or sell the right currency without worrying about breaking the many management rules.